1. Bacon, Sausage & Fried Eggs on toast with any standard size hot drink. Only £5 until 11am Monday to Friday of Restaurant week. 2. Fruit or Cheese Scone with any standard size hot drink only £3 until 11am Monday to Friday of Restaurant Week. Whether you're walking on Hadrian's Wall or exploring Hexham's historical Abbey, Mucho Gusto is the place to visit for simple, good value homemade food and drink. 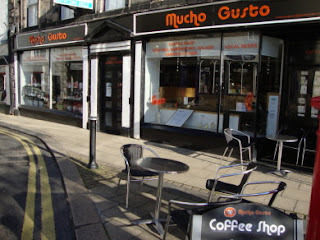 Conveniently situated in Hexham's Market Place, Mucho Gusto is a welcoming place to grab a takeaway or catch up with friends over a cappuccino and a toastie. We bake our own scones and traybakes, and all of the sandwich fillings are freshly prepared by ourselves each morning. We have Gluten Free options available in the form of our Homemade Chocolate Brownie and our delicious Clementine & Almond Cake.